More and more of our customers are on the go. They need a Hotspot (MiFi) for their mobile office, homes or office buildings. They need to keep connected to family and friends and maybe for work as well. The problem is, there is not always a strong, reliable cellular signal. The connection to their device where they travel is not reliable. Here are some tips on how to improve the signal to your hotspot using a cellular signal booster. Will A Cell Phone Signal Booster Increase Your Hotspot Data Speeds? Yes. A cellular signal booster will keep you and your hotspot connected wherever you go. So, what are your options and which would be best for how you use your Hotspot? The first question is, how and where are you going to use your hotspot. If you're using your hotspot in a building then any building signal booster is going to work great for you. Plus, it's going to boost the signal for your phone and improve the cell coverage as well. You can get a building signal booster system for where you live or where you work. If you are using your hotspot on the road, then think about how you're using it. Are you traversing the country in an RV? Or are you traveling on business and using the front seat of your car as a mobile office? Maybe the hotspot is nothing more than a pacifier. It keeps everyone happy on the family vacation so everyone can use their tablets on the drive. Whatever the situation may be, one of the following scenarios will keep you connected. What if you want to boost your hotspot and cellphone at the same time. Then something like the weBoost Drive 4G-X or the Drive 4G-X RV is going to be your best bet. The Drive 4G-X sends a boosted signal throughout your car or truck. It works much like the WiFi your hotspot produces. With this system, you will install an inside antenna (like the image above) in the vehicle. Then anyone within its boosted range will benefit. A signal booster like this works with several users. You can use your hotspot while simultaneously placing calls or streaming music from your phone. This is super handy if you're traveling with the family or friends. It's also great if you've got more than one hotspot that are carrier specific - like the verizon jetpack or the AT&T Go Phone. If you have friends that have different hotspots, they can each bring one and everyone's going to be happy. 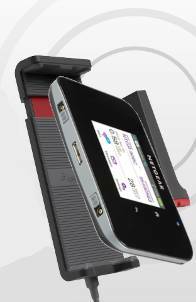 Here's a link for more information on the weBoost Drive 4G-X Mobile Booster. Cradle boosters are easy to install. All you have to do is slip the hot spot into the cradle and you'll have a really strong connection. Cradle boosters work great because the hotspot sits right up against the inside antenna built into the cradle. So you get a very strong connection. However, they only work for one device at a time. The cradle booster is designed to boost just for the device in the cradle. For multiple devices (like a cell phone or hotspot or multiple hotspots), see the Drive 4G-X above. A Cradle Booster can work really well for the family vacation scenario boosting Wi-Fi for the kids or maybe in an RV where you're using the hotspot as an access point to the Internet. Do Signal Boosters Help Get Faster Data Speeds? Now that you know all about mobile hotspot boosters, will they increase your data speeds? If you already have a perfect signal? No, they are not going to increase your data speeds. But let's be honest that hardly ever happens. What they will do is give you a stronger signal. This will allow your hotspot to transfer that data quicker. Here are some tips to maximize the effectiveness of your Wi-Fi hotspot. The boosted signal is going to be the strongest the closer you get to the inside antenna. So place the hotspot as close as you can to that inside antenna. This will keep you connected in even the weakest signal areas. With a booster, the signal will be better the closer you get to the hot spot. Consider putting your hot spot and booster antenna or cradle centrally in the vehicle. This will allow everyone to have equal access to the signal. Or, if you're using it all by yourself, place it where you're going to be using it the most. We hope these tips help you in getting the most out of your mobile hotspot. If you've got any questions, please feel free to Contact Us.